The Costa Blanca, the tourist name given in Spain to the coast that bathes the province of Alicante, is one of the favorite tourist destinations of sun, beach and fun lovers. Talking about the Costa Blanca is talking about great beaches and coves, but also about gastronomy and nightlife. Within the Costa Blanca we find the towns of Denia, Jávea, Benitatxell, Teulada-Moraira, Benisa, Calpe, Altea, Alfaz del Pi, Finestrat, Villajoyosa, Campello, Elche, Santa Pola, Guardamar del Segura, Torrevieja and the beaches of Orihuela Costa and Pilar de la Horadada. 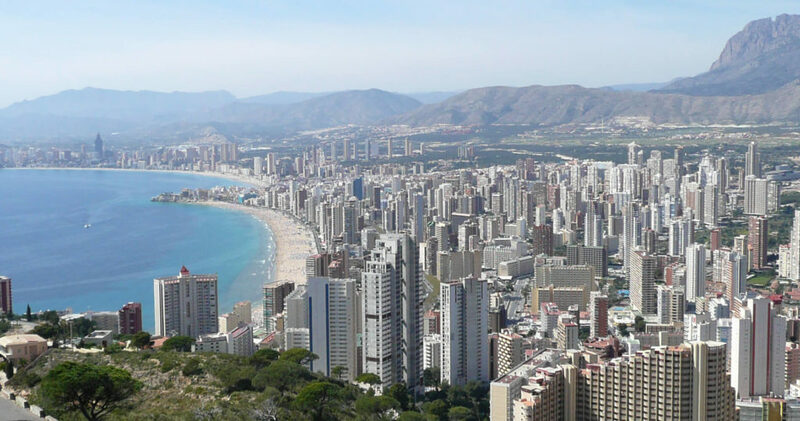 This time we will focus on Benidorm and Alicante, two of the most famous cities on the Costa Blanca where the good weather and party are guaranteed throughout the year. Ready to know what they have to offer? Beaches, leisure, health, fun, comfort, culture…. Benidorm, also known as the “New York of the Mediterranean” for the large number of skyscrapers that rise up on the horizon, has absolutely everything you have in mind to enjoy a good vacation, whether you are a daytime person or a nightly owl. Its over 300 days of sunshine a year and its excellent hotel options for all tastes – for families, adults only, for the most urban, for golf lovers, for the most exclusive guests, etc – make Benidorm an unbeatable destination to travel to on any occasion, alone or accompanied by your partner or the whole family. Although the city itself has no great monuments or great places of cultural interest, it does offer tourists some attractions such as the Torre Punta del Cavall, the Tossal de la Cala, the Mirador de la Mirador del Castillo or “Balcón del Mediterráneo” in Punta del Canfali, the Parque de L’Aigüera (designed by Ricardo Bofill) or the Iglesia San Jaime, patron saint of Benidorm. What Benidorm can boast of is beaches and coves, such as the popular beaches of Levante and Poniente, where you can sunbathe even in winter; Cala del Tio Ximo, Cala Almadrava and Cala de Mal Pas, perfect for lovers of diving and less crowded bathing. If you’re into strong emotions, you can’t miss a visit to one of the theme parks of Terra Mítica, Terra Natura, Mundomar and Aqualandia. Alicante, also known as the City of Light, is the capital of the Costa Blanca and has a history of over three thousand years that has left its mark on different civilizations, such as the Castle of Santa Barbara, one of the largest medieval fortresses in Spain. A city with cultural life (with seven museums and even an Ibero-Roman archaeological site, Lucentum), with large parks and gardens (such as the famous Esplanada de España, the Paseo de Gomez or the parks of Canalejas and El Palmeral) and a vibrant nightlife. Playa de Agua Amarga (one of the only dog-friendly beaches in Europe) is one of the best beaches on the Mediterranean coast. Another recommended visit is the island of Tabarca, the only inhabited island in the Valencia Region. 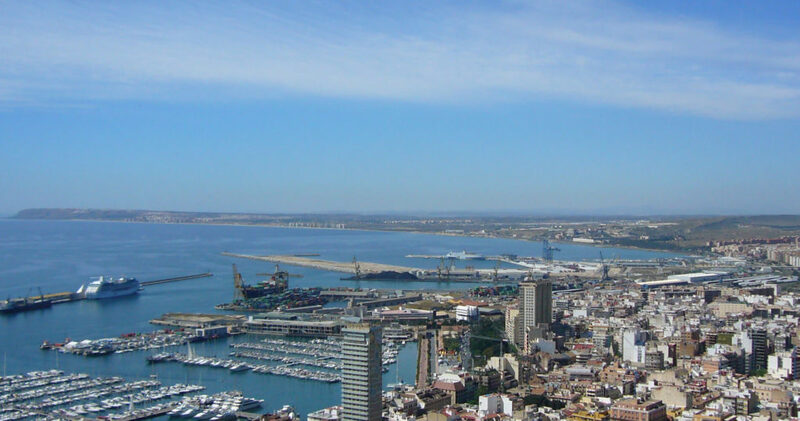 As for accommodation, the city of Alicante has a wide range of accommodation throughout the city, although it is always more advisable to choose the most central or a few meters from the port of Alicante to enjoy the monuments during the day and the Alicante nightlife.